By far the most memorable experience I have had whilst conducting research for Lovers of Philosophy has been meeting Hermann Heidegger, the 93-year-old son of Martin Heidegger. Martin Heidegger, one of the seven philosophers whose love life I explore in my book Lovers of Philosophy, was one of the most influential and controversial philosophers of the twentieth century. My meeting with Heidegger’s elderly son came about totally by accident. I say that, but one thing I have noticed is that ever since I have followed my dreams in researching and writing this book, strange coincidences keep favouring me. In January 2013, I went to the inaugural meeting of a discussion group in my home town of Brisbane for psychiatrists interested in philosophy. When I arrived, there was only one other person there. I introduced myself and it turned out this gentleman was German. I told him I was writing about the love lives of seven European philosophers, including four Germans – Kant, Hegel, Nietzsche and Heidegger. His response at that point staggered me. My jaw dropped. I couldn’t believe it. I had been reading about Heidegger’s life for the last three years – about his philosophy that anticipated existentialism, about his controversial joining of the Nazi Party during the war. And about his extramarital love affair with his Jewish philosophy student Hannah Arendt, who went on to become one of the twentieth century’s most articulate critics of totalitarianism. ‘Did you say your mother knows Heidegger’s son?’ I said, still incredulous. The psychiatrist explained that he was from Freiburg, where the Heideggers lived. And yes, he thought his mother might be able to arrange an introduction. 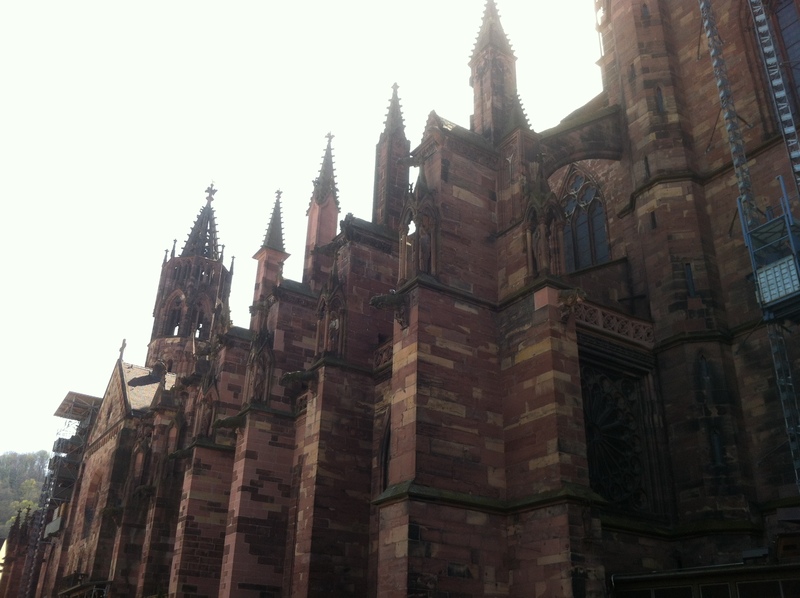 Two months later I was on a twenty-seven-hour flight from Brisbane to Frankfurt. From there I caught the train south to Freiburg, where I checked into a quaint but very welcoming hotel. I explained to the very friendly reception staff that I only wanted to speak German for the week I was there. They good-naturedly agreed to grant my request, even though my very limited vocabulary and mangled grammar must have grated on them. I also mentioned that I was in town to visit Heidegger’s son, and they knew immediately of which family I was speaking. The receptionist even knew where the Heideggers lived. Freiburg turned out to be an incredibly picturesque university town, its cobblestone streets teeming with students, bicycles and bookshops. The towering gothic spire of the town’s central cathedral, known as the Münster, dominated the modest skyline of the town, which itself was nestled at the very edge of the Schwarzwald (Black Forest). Before leaving Brisbane, I had booked a German language teacher to meet with me every day in Freiburg to improve my rudimentary acquaintance with the local language. I had also booked an interpreter for the upcoming interview with the great philosopher’s son. When the day for the interview came, I put on my suit and caught a taxi to the Heideggers’ home, a small and modest but welcoming cottage on the outskirts of Freiburg. There were quite a few green farm fields scattered here and there around the sparsely developed settlement known as Attental, in which they lived. There was a thick layer of grey fog in the air that day, and everything felt a little surreal as the taxi pulled up outside the address I had been given. But the interpreter Katherina and I were immediately put at ease by the warm reception granted to us by the spritely 93-year-old who greeted us. Hermann Heidegger introduced himself, his wife Jutta and his son Arnulf. In Hermann Heidegger’s modest lounge-room I got to hear about his childhood memories. Memories of his father insisting on quiet whilst he worked away at his desk. Memories of attending a Hitler rally when he was only twelve years old. This was on the 29th July, 1932, when Hitler addressed a crowd of 50,000 people in Freiburg’s local football stadium. Hermann’s mother, Elfride, had dressed him and his brother Jörg up in their best slacks, white shirt and tie before taking them to the rally. Hermann explained to me that his father, Martin, didn’t attend the rally because, unlike his mother, he wasn’t that interested in politics. He preferred to work on his philosophy. Hermann also shared with me his memories of how, after the Nazis had taken power, his father got caught up in the stressful to-and-fro of politics regarding the local university’s administration. It was then that Martin Heidegger took an action that would see him come under heavy criticism for decades to come – he joined the Nazi Party. In that lounge-room I also saw Heidegger’s 93-year-old son going soft in the face, as if he were a child again, as he recalled some of the more tender and personal memories from his childhood days. Memories such as boating down the Rhineland’s famous rivers with his father. And playing in the snow with his brother outside Die Hütte, the forest hut that the family regularly retreated to during their holidays. I heard about Heidegger’s friendship with the philosopher Edmund Husserl, who was Jewish and therefore excluded from Freiburg University by the Nazis at the time that Heidegger was Rector (or Dean). Hermann showed me a letter that his mother wrote to Husserl’s wife, Malvine, on the 29th April, 1933, expressing sympathy and concern about how the war was affecting them. Despite their political differences, the two families were still on friendly terms, at least according to the account Hermann Heidegger provided to me on that day. I feel very privileged to have been able to conduct this interview, extracts of which I plan to include in my upcoming book Lovers of Philosophy. I’ve just heard some wonderful news. 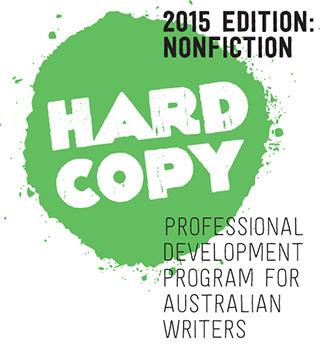 I am one of 30 lucky writers to be selected into the HARDCOPY professional development program for Australian writers. As a result I will soon be getting some precious feedback on my Lovers of Philosophy project from the HARDCOPY selection panel, which includes Australian nonfiction authors Paul Daley, Dr Jen Webb, Dr Frank Bongiorno and Biff Ward. But that’s not all! Along with the other winners I will be heading to Canberra later this month for a three-day project/manuscript development intensive masterclass with professional freelance editor Nadine Davidoff. In September, I’ll be invited back to the nation’s capital for ‘Intro2industry’, a three-day seminar on all facets of the publishing industry. Ten of the 30 applicants will proceed in November to Round 2 of the program, which involves one-on-one consultations with publishers. I’m very grateful for this wonderful opportunity to further develop my manuscript and writing skills. And of course, I can’t wait to meet the other emerging writers and hear about their projects. I’ve already found one of my fellow winners on the blogosphere – Michelle Scott Tucker. Thank you to the ACT Writers Centre who run the HARDCOPY program. My thanks also to The ACT Government and the Australia Council who support this program. 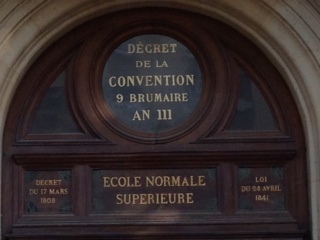 The last stop of my visit to Paris exploring the old haunts of the French philosophers is the Sorbonne. A beautiful and ancient large sandstone building, it dominates the Latin Quarter’s bustling urban terrain of cafés, bookshops and boutiques. My daughter Alex and I first spot it while riding northwards towards the Seine on the wide arterial of St Michel Boulevard, along with Paris’s other peak hour traffic of motor scooters, bicycles, Citroens, Peugeots and pedestrians. We gasp at the sight of it rising up to our right, its majestic features brought into spectacular contrast by the rays of the setting sun. 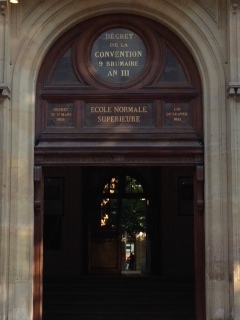 Simone de Beauvoir was a student at this venerable institution in 1929 when she met Jean-Paul Sartre. 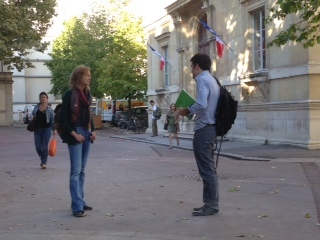 It was here that she studied for and passed the agrégation, the highly competitive national examinations in philosophy. Passing this entitled her to lifelong tenure teaching philosophy in France’s high schools. By 1943, however, she had managed to lose this privilege in scandalous circumstances when a parent complained she and her partner Jean-Paul Sartre had both seduced their teenage daughter while she was Beauvoir’s student. Beauvoir and Sartre had got away with such behaviour previously with other students, but on this occasion it led to Beauvoir having her teaching licence permanently revoked. This sanction didn’t have much of a negative impact on Beauvoir’s life, however, as by this time she had had developed a considerable reputation as a writer and as Jean-Paul Sartre’s celebrity partner and co-spokesperson for the new philosophy of existentialism. 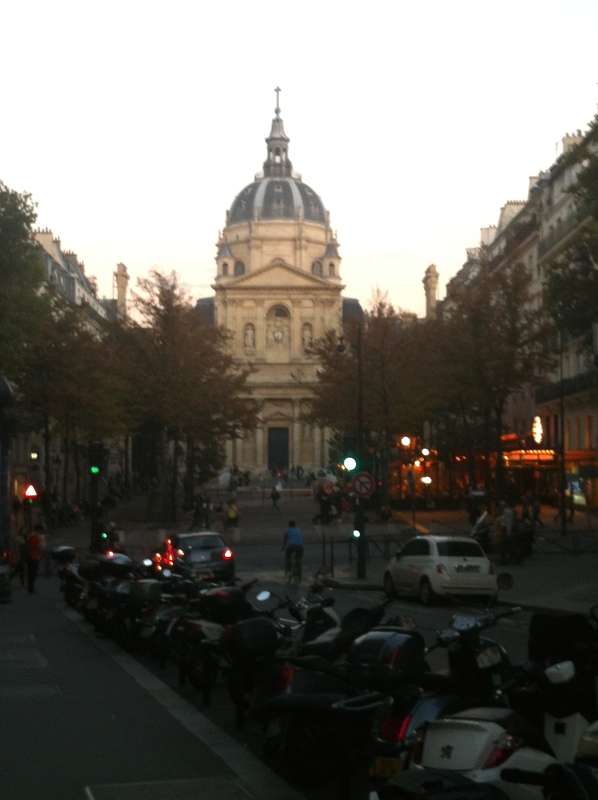 The Sorbonne, founded in the mid-12th century, was one of the very first universities to be established in Europe, and has been a centre of intellectual activity in Paris ever since. 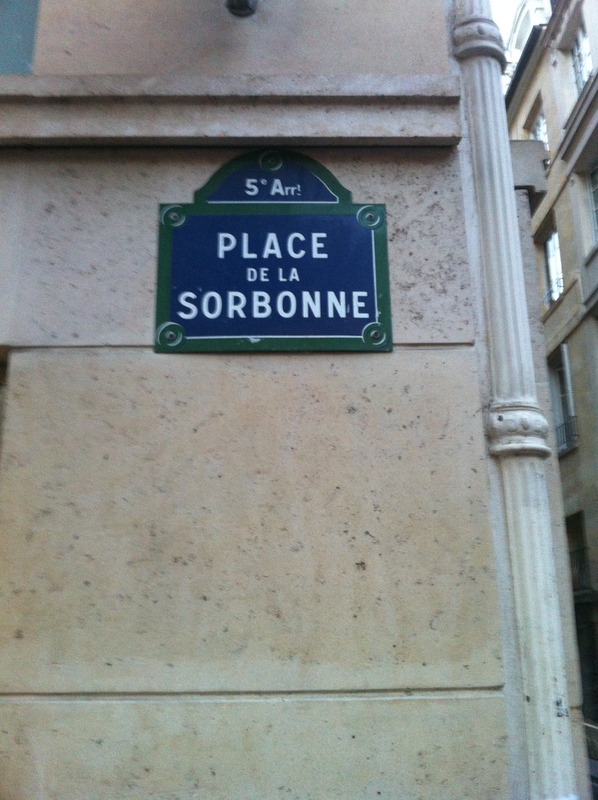 More recently, the Sorbonne was the central stage for the notorious uprisings that brought Paris to a standstill in May 1968. These protests, which began with students occupying the Sorbonne’s buildings in response to government policies about university administration, spread like wildfire amongst other students, teachers and workers throughout France culminating in a general strike of a staggering ten million workers. 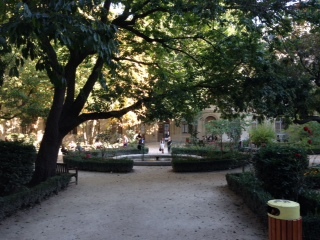 Throughout the weeks of civil disorder that took France to the brink of collapse, the Sorbonne became a battleground for bitter hand-to-hand fighting between students and riot police. Makeshift barricades of furniture, cars and street debris were erected by the Left Bank’s protesting students just as they had been in the French Revolution two hundred years earlier. For several days, the whole country held its breath, fearful of a another revolution, until eventually a very rattled President de Gaulle accepted the resignation of his Prime Minister Georges Pompidou and called for a general election, finally diffusing the mutinous mood in the streets. Today, my hopes of exploring the interior of this venerable institution are frustrated by a uniformed security officer guarding the entrance. So I resign myself to taking in the view from the outside as a steady stream of students and teachers come in and out. In front of the building, the Place de la Sorbonne — a large busy square open to the public — is abuzz with young students milling among its sidewalk cafés and bookshops. A sign that says Libraire Philosophie announces a bookshop devoted solely to philosophical texts, a sight I have seen more than once on this trip to Paris but never in my home country of Australia. 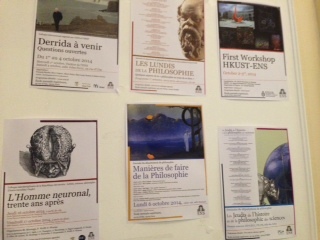 The bookstore appears to be connected with the university, as it has a poster announcing the Sorbonne’s philosophical courses and the associated recommended reading. The philosophy of Sartre and his philosophical predecessor Martin Heidegger feature heavily. Phenomenology and existentialism still appear to be fashionable in this part of town. As I bask in the beauty of this glorious building and its changing colours in the fading sunset, it occurs to me that all the places in which Sartre and Beauvoir studied, wrote, dined, drank, conversed and made love during their years as Paris’s favourite intellectuals are within walking distance of this square. 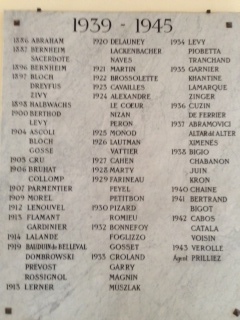 They were even buried only a stroll away in the Cimetière Montparnasse. In front of the aforementioned bookshop, I catch sight of two young lovers deep in an embrace. I imagine that Sartre and Beauvoir would have sometimes met in this exact place during the heady early days of their lifelong love affair. I grab my camera, thinking the scene before me might just be a perfect cover for the book I have recently finished writing – Lovers of Philosophy – about the love lives of Sartre and other influential European thinkers. I wonder, as I capture these two paramours on film outside the philosophy bookshop, could they be a Jean-Paul Sartre and Simone de Beauvoir of the future? I was delighted recently to receive a call from Stacey Clair at the Queensland Writers Centre (QWC) to inform me that I was one of the ten successful applicants for the QWC / Hachette Manuscript Development Program. Along with the nine others from around Australia, I have been invited to a four-day Manuscript Development Retreat in Brisbane from 31 October to 3 November 2014 at which editors from Hachette Australia, one of Australia’s largest publishers, will provide individual feedback and consultation to help me work on developing my manuscript. I will also get to meet other publishing industry professionals such as literary agents, booksellers and established authors. At the residential retreat in Brisbane I will have four glorious days to write, mix with other emerging writers, and tap into the expertise of those in the publishing industry. I can’t wait to meet the other writers and making the most of this wonderful opportunity. After years of researching, writing, editing and polishing my manuscript for Lovers of Philosophy, this is very welcome news, one of those breaks every budding, struggling writer hopes for. Thank you QWC and Hachette! 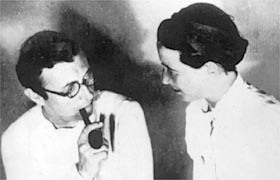 Sartre and de Beauvoir’s relationship lasted continuously for over fifty years from soon after they met in 1929 until Sartre’s death in 1980. But their relationship was a most unusual one. From the very beginning of the relationship, they agreed, at Sartre’s suggestion, that each would be free to take on other sexual partners as they pleased. But to avoid jealousy or the deceit characteristic of many bourgeois marriages, they would be totally honest with each other at all times about their other liaisons. As it turns out, they both took on many lovers and shared honestly with each other about their experiences. Sartre, in particular, seemed addicted to seduction, spending long periods pursuing his quarry, and keeping de Beauvoir informed of his progress. But de Beauvoir, too, had many lovers, a considerable number of them female. Their lovers were often students, young actresses or courtesans, all plentiful in Paris in the 1920s and 1930s. Both philosophers, by choosing this lifestyle, were being true to the existentialist philosophy they developed, which was based on exercising one’s personal freedom to create a life worth living. They also fulfilled what they believed was their duty to document this existentialist experiment, in the many novels, letters and memoirs they left behind.